SGA distributed cards to students outlining the “Run, Hide, Fight” protocol created by the Department of Homeland Security. According to the Gun Violence Archive, more than 40 mass shootings have occurred in the first three months of 2018, with many of the most infamous, including the Feb. 14 massacre in Parkland, Florida, taking place in schools. With the seemingly endless stream of news coverage focusing on such attacks, it can feel like tragedies will keep happening with no way to stop them, with nothing to do but watch in fear. However, at Concordia, both employees and students are working to protect the school from threats. One such person is Roger Olson, director of risk management at Concordia. Alongside Karleen Mjolsness, a risk management specialist, Olson protects all aspects of Concordia—the people, property, programs, finances, and reputation—from various kinds of threats. One preventative measure is actually a group of people, called the behavioral care team. “They just discuss things that might be kind of red flags. From a preventative standpoint, that’s probably the most important thing we can to is to head off any type of thing that might happen in the first place,” Olson said. “It’s very, very rarely just a stranger off the street who comes in and perpetrates these types of events. So most higher ed institutions develop some sort of team that could kind of take a look at behavioral issues and see some of these warning signs. In addition to the behavioral care team, Concordia also has some material precautions in place to ensure students’ safety, including an increased number of security cameras, the e2Campus alerts system, and the blue light assistance telephones. According to Olson, many of these precautions were implemented on Concordia’s campus, and on campuses around the country, in response to the Virginia Tech massacre in 2007, which killed 32 people. “The initial response to [Virginia Tech] was institutions started looking into primarily … physical type responses,” Olson said. Part of the responsibility of protecting students falls on the shoulders of Bill MacDonald, Concordia’s director of public safety. MacDonald’s role includes training faculty and departments in the “Run, Hide, Fight” template created by the Department of Homeland Security. However, public safety does not just host training for the Concordia community; they also partner with the Moorhead Police Department to host larger scale training sessions. “In the summertime we provide a location for them. They host a regional hostage negotiation school which brings law enforcement from the upper midwest and Canada to our campus and they train here,” MacDonald said. Concordia’s public safety also works to host training for the regional SWAT team, compiled from Cass and Clay county law enforcement offices. While they may not be stationed on Concordia’s campus full-time, Olsen believes it is beneficial for armed law enforcement and the SWAT team to be familiar with it. 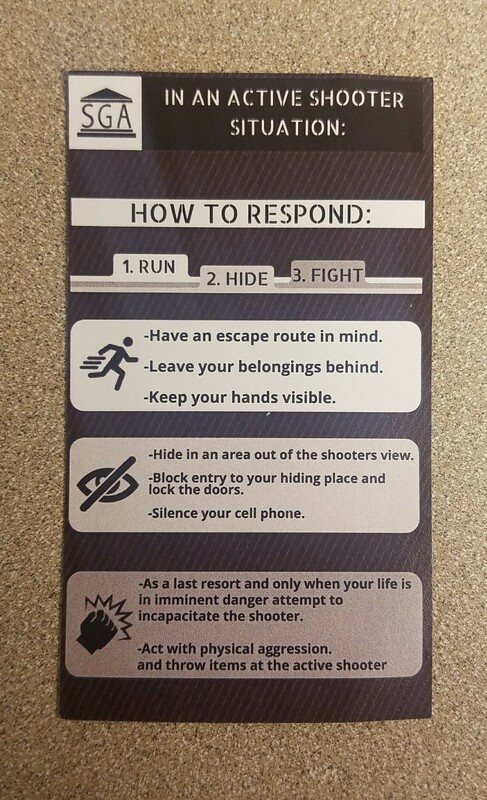 MacDonald also worked with Concordia’s Student Government Association on a recent initiative intended to increase students’ awareness of how to respond in case of an active shooter situation. 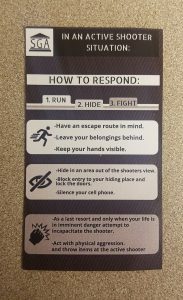 As part of this initiative, which was the brainchild of SGA Vice President Will Kuball, small cards detailing the “Run, Hide, Fight” template were placed in students’ mailboxes. Kuball collaborated with MacDonald to compile the card’s content and had Meghan Horan, SGA’s director of communications, design it. It is clear to some students that this information needs to accompanied by awareness of the precautions already in place. Not everyone on campus is aware of the behavioral care team or the red key system, which allows a professor or faculty member to lock any classroom door from the inside. Some students, including first-year Parker Haug, were surprised and pleased to learn that Concordia had taken these steps. Senior Gen Holmes also agreed that this information needs to be more widespread on campus. “If it was more public I’d feel a lot safer, because I didn’t even know it existed,” Holmes said. However, students had mixed opinions on how Concordia should move forward with active shooter precautions in the future, especially in light of President Donald Trump’s recent suggestion that arming teachers could increase school safety. Holmes believes that teachers should not be armed at all. “I think we should be making schools more secure, like change layouts of schools and add more public safety officers … teachers are civilians and they shouldn’t have to make the choice,” Holmes said. Concordia senior Sadie Mendenhall-Cariveau, a veteran of the United States Air Force, disagreed with the lack of active shooter policy beyond the Department of Homeland Security’s prescribed “Run, Hide, Fight” template. “With a ‘Run, Hide, Fight’ concept for dealing with an active shooter, you generally tend to have people just scattering, and that makes them easy targets,” Mendenhall-Cariveau said. However, Mendenhall-Cariveau is not in support of arming faculty, either. Although student opinions may vary on how Concordia should proceed with precautions for active shooter situations, one thing is clear: Concordia is taking school shootings like Parkland and Virgnia Tech seriously and will continue to assess these precautions to ensure the safety of its students.